Thanks to Horace Rockwell, the first known itinerant artist to visit and make a living in Fort Wayne, we have the Samuel Hanna Family portrait in the Fort Wayne Museum of Art’s collection. An oil painting on canvas, Hanna commissioned Horace Rockwell in 1843 to paint the piece that measures slightly over five feet square. It depicts the prominent Fort Wayne Hanna family grouped around a table in a conversational setting. Judge Samuel Hanna was an important pioneer considered to be the father of Fort Wayne and responsible for the community’s development bringing the canal, railroad and roadways to the region. Another important Fort Wayne family was painted on even a larger canvas when Rockwell was engaged by Dr. Lewis G. Thomason for a family portrait to include his wife, their five children, as well as his wife’s sister, the widow Elizabeth Forsythe, and her daughter Margaret. Now a part of the Newark New Jersey Museum, this work is believed to have been painted sometime between 1842 and 1845. Although there have been attempts to show a family relationship with the American illustrator Norman Rockwell, one has yet to be discovered to document the claim. The Allen County History book published in 2005 has a half dozen additional images of his work in addition to the two mentioned above. Many of his paintings were not of the large-size format in the naïve portrait manner, such as the three of Aboite Township’s first postmaster and canal inn proprietor, Jesse Vermilyea and his wife Maria. 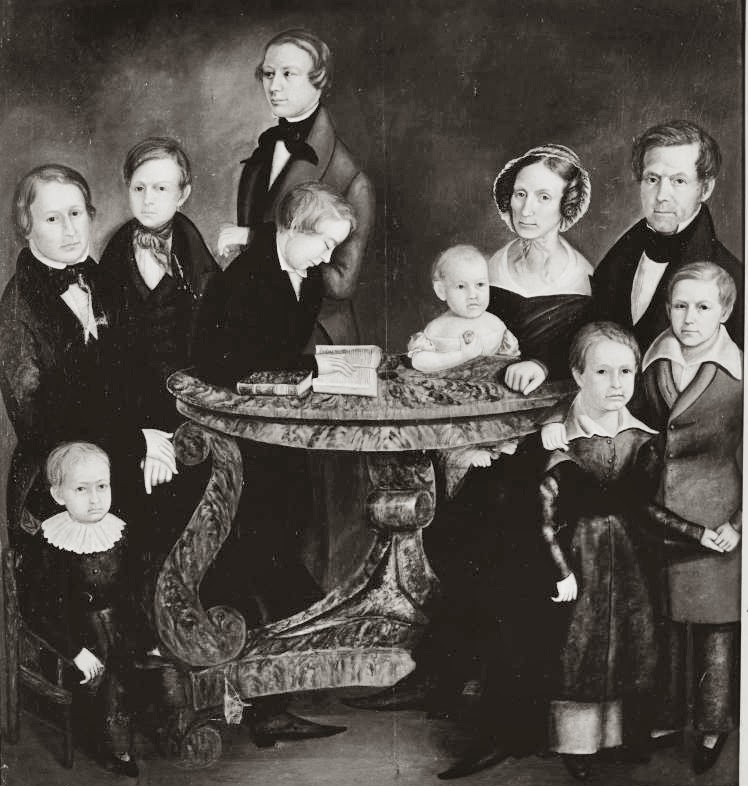 The Vermilyea portraits were painted about 1840 and are a part of the Allen County Fort Wayne Historical Society’s collection. While artists working in cities had their own studios, provincial painters were usually itinerants and sometimes lived with the families who patronized them. Some art historians believe that Rockwell utilized a technique of painting the subjects’ torsos dressed in the appropriate fashion of the day in his studio, packed up his paints and canvas and traveled on location to finish the work of placing the heads with recognizable faces on each. If that were the case, in order to reach Fort Wayne from the East, Rockwell likely would have had to travel from Lake Erie along the Maumee through the infamous and treacherous Black Swamp. Rockwell, however, is known to have resided with the Thompson family for about six months while completing their portrait, according to Ann M. Reed in her book My Grandmother and Her Family. Horace Rockwell settled in Fort Wayne in 1836 and is considered to be the city’s first professional painter. In the 1850 census he is listed as living in Fort Wayne under the name of Cirael or Carael Rockwell, age 43, born in New York. At some point Rockwell moved a short distance west to the Wabash & Erie Canal town of Roanoke, where he and his wife Orrinda settled into a house on Posey Hill Street. He operated a trade sign business and continued his painting such as the one titled, “Rebekah at the Well”, now in the Roanoke Heritage Center’s collection. Even though Rockwell lived a secluded life style, his wife and daughters were sociable and prominent in their village community. At times the artist would quietly leave town heading to places such as New York City or Cincinnati where he would exhibit his oil paintings, win art competitions, and sell his pictures at good prices, before returning unobserved to Roanoke. Rockwell, who dabbled with inventions, was considered by some a man of genius with more than ordinary ability. When not painting he devoted himself to the construction of a flying machine well before the time of the Wright Brothers. The house still stands in Roanoke where Rockwell, in about 1852, attempted to fly his contraption designed to mimic bird wings from, some say, his home’s second floor window or his roof. It is not recorded whether he launched from the front or the rear of his house on Posey Hill Street. If it were the back side, the topography drops away steeply. His flight, more vertical than horizontal, ended abruptly at the base of his residence with the operator’s bruised body among the wreckage. A doctor was summoned to tend his several contusions and broken bones. His speech not having been hindered, he responded to questions of what went wrong, to which he replied that it wasn’t the fault of the machine but that he, “forgot to flap his wings.” The flying experience put an end to his experiments and he is reported to have died years later in 1877. Orrinda Rockwell could not bear the loss of her husband, so intense was her anguish, that she refused nourishment of any form. Finally, she was persuaded to eat, but her stomach being in such a weakened condition, proved fatal. She died shortly thereafter and was laid to rest beside Horace in the Roanoke Cemetery.